From "Historic Families of America" and "The Twentieth Century Biographical Dictionary of Notable Americans: Volume IIV" and "A Naval History of the American Revolution" by Gardner W. Allen. 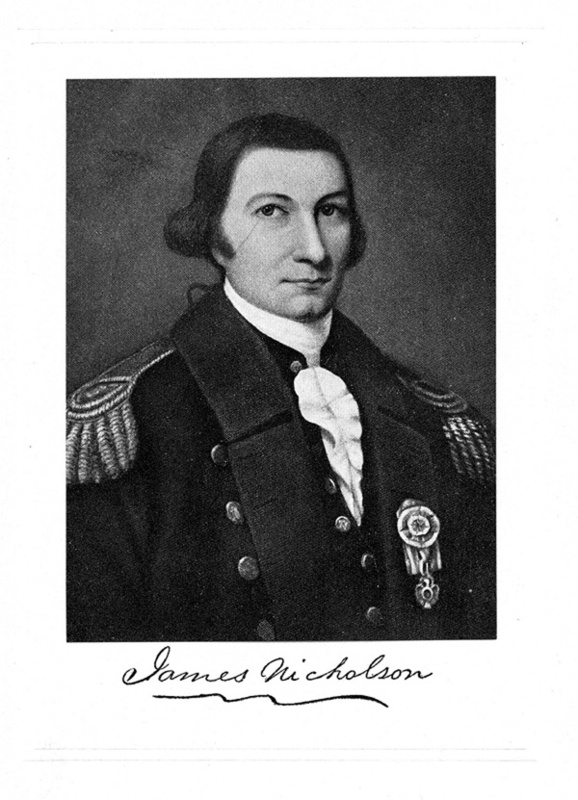 James Nicholson, son of Joseph Nicholson and Hannah (Smith) Scott, was born in Chestertown, Maryland, in 1737 or 1738. He entered upon a sea-faring life at an early age and was with the British fleet when Havana was captured in 1762. From 1763 until 1771, he was a resident of New York City. At the outbreak of the Revolution, he tendered his services to the navy and was placed in command of the DEFENSE, a Maryland vessel with which, in March, 1776, he recaptured several prize ships from the British. In June, 1776, he was placed in command of the VIRGINIA, a 28 gun ship of war. A resolution of Congress, October 10, 1776, declared that the number of captains in the Continental Navy should be 24 and should rank in the order designated. By this resolution, James Nicholson appeared first on the list and was thus senior captain and Commodore-in-Chief of the Continental Navy. Subsequently, Nicholson was appointed captain of the 38 gun frigate TRUMBULL. The Trumbull sailed from New London late in May and had not been long at sea when she fell in with the British letter of marque WATT and was soon engaged in one of the hardest-fought naval actions of the war. In Nicholson's account of the battle he says: "At half past ten in the morning of June [1st], lat. 35. N. long. 64 W. we discovered a sail from the mast-head and immediately handed all our sails, in order to keep ourselves undiscovered until she came nearer to us, she being to windward. At eleven we made her to be a large ship from the deck, coming down about three points upon our quarter; at half past eleven we thought she hauled a point more astern of us. We therefore made sail and hauled upon a wind towards her, upon which she came right down upon our beams; we then took in our small sails, hauled the courses up, hove the main top-sail to the mast, got all clear for action, and waited for her. "At half past eleven we filled the main-top (the ship being then about gun-shot to windward of us) in order to try her sailing, also that by her hauling up after us we might have an opportunity of discovering her broadside. She immediately got her main tack out and stood after us; we then observed she had thirteen ports of a side, exclusive of her briddle ports, and eight or ten on her quarter deck and forecastle. After a very short exhortation to my people they most chearfully agreed to fight her; at twelve we found we greatly outsailed her and got to windward of her; we therefore determined to take that advantage. Upon her observing our intention she edged away, fired three shot at us and hoisted British colours as a challenge; we immediately wore after her and hoisted British colours also. This we did in order to get peaceably alongside of her, upon which she made us a private signal and upon our not answering it she gave us the first broadside, we then being under British colours and about one hundred yards distant. We immediately hoisted the Continental colours and returned her a broadside, then about eighty yards distance, when a furious and close action commenced and continued for five glasses, no time of which we were more than eighty yards asunder and the greater part of the time not above fifty; at one time our yard-arms were almost enlocked. She set us twice on fire with her wads, as we did her once; she had difficulty in extinguishing her's, being obliged to cut all her larboard quarter nettings away. "At the expiration of the above time my first Lieutenant, after consulting and agreeing with the second, came aft to me and desired I would observe the situation of our masts and rigging, which were going over the side; therefore begged I would quit her before that happened, otherwise we should certainly be taken. I therefore most unwillingly left her, by standing on the same course we engaged on; I say unwillingly, as I am confident if our masts would have admitted of our laying half an hour longer alongside of her, she would have struck to us, her fire having almost ceased and her pumps both going. Upon our going ahead of her she steered about four points away from us. When about musquet shot asunder, we lost our main and mizen topmast and in spite of all our efforts we continued losing our masts until we had not one left but the foremast and that very badly wounded and sprung. Before night shut in we saw her lose her maintopmast. I was in hopes when I left her of being able to renew the action after securing my mast, but upon inquiry found so many of my people killed and wounded and my ship so much of a wreck in her masts and rigging, that it was impossible. We lost eight killed and thirty one wounded; amongst the former was one lieutenant, one midshipman, one serjeant of marines, and one quarter gunner; amongst the latter was one lieutenant, since dead, the captain of marines, the purser, the boatswain, two midshipmen, the cockswain, and my clerk, the rest were common men, nine of which in the whole are since dead. No people shewed more true spirit and gallantry than mine did; I had but one hundred and ninety-nine men when the action commenced, almost the whole of which, exclusive of the officers, were green country lads, many of them not clear of their sea-sickness, and I am well persuaded they suffered more in seeing the masts carried away than they did in the engagement. The Watt, greatly shattered, got into New York June 11. The accounts of her force vary somewhat. She seems to have mounted twenty-six twelve-pounders and from six to ten sixes. Her crew was reported to number two hundred and fifty, but one New York paper made it one hundred and sixty-four. Her commander, Captain Coulthard, describing the action, says: " Saw a large ship under the lee bow, bearing N. W. by W., distant about three or four miles; supposed her to be a rebel vessel bound to France and immediately bore down upon her. When she perceived we were standing for her she hauled up her courses and hove too. We then found her to be a frigate of 34 or 36 guns and full of men and immediately hoisted our colours and fired a gun; she at the same time hoisted Saint George's colours and fired a gun to leeward. We then took her for one of his Majesty's cruizing frigates and intended speaking to her, but as soon as she saw we were getting on her weather quarter, they filled their topsails and stood to the eastward. We then fired five guns to bring her to, but she having a clean bottom and we foul and a cargo in, could not come up with her. Therefore, finding it a folly to chace, fired two guns into her and wore ship to the westward; at the same time she fired one gun at us, loaded with grape shot and round, and wore after us. Perceiving this, we immediately hauled up our courses and hove too for her. Nicholson received a Letter from the Board of Admiralty, dated June 30, congratulating him upon "the gallantry displayed in the Defence" of his ship in his recent action with the Watt and urging "exertions in Speedily refitting" her. TheTRUMBULL spent the first half of the year 1781 fitting out at Philadelphia for a cruise, under the accustomed difficulties imposed by lack of money and scarcity of seamen. After peace was declared, James Nicholson settled again in New York City and from 1801 to 1804 was a United States Commissioner of Loans. He was interested in public affairs and became one of the leaders of the Republican Party in New York and also exercised a decided influence in New York politics. He was particularly opposed to Alexander Hamilton and was often engaged in controversies with that statesman and his supporters. He married, April 30, 1763, Frances Witter of New York, daughter of Thomas and Mary (Lewis) Witter. He died in New York City, September 2, 1804.